It takes practice to learn to play the guitar. Sometimes lots of practice. The good news is, there are a lot of ways you can practice. Not everybody learns the same way, and when it comes to play guitar, or any instrument, this couldn’t be more true. Here are some guitar practice tips that can help get you started developing a practice routine that will work well for you. Set a regular time for practice and try to stick with it. There will be times when you can’t make a practice and that’s fine, but the more regular you keep it, the more consistent your progress will be. Try to find a personal space for practice that’s free of distraction. Focus is important when you’re trying to work. When you’re practicing you get warmed up and sometimes play better as you go. Breaking up your practice can prevent you from getting into the right frame of mind, which leads to an uneven practice session. If you have both an acoustic and electric guitar available, alternate practicing between the two of them, particularly if you’re working on scales or difficult solos. Playing on an acoustic can be more of a challenge when you’re working on licks and solos, so playing them on the acoustic forces you to work that much harder, which makes it easier to play the same thing when you switch back to an electric. 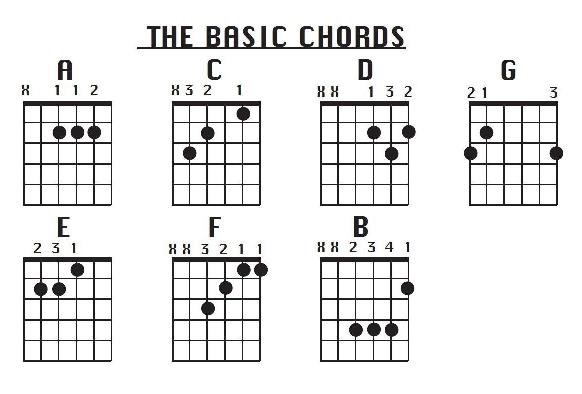 If you’re just getting started, work consistently to memorize a new chord or two each week, starting with the basic chords and the barre chord shapes shown below. 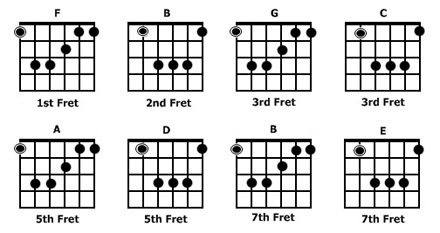 Make a concentrated effort to learn the fretboard. Commit it to memory by playing scale patterns in a variety of positions. The example here shows major scale patterns laid out on the guitar. While no one can tell you how to practice guitar, developing a regular practice pattern that covers the basics and introduces advanced techniques at a gradual pace is one of the best ways to improve your playing. These guitar practice tips are suggestions that should be useful as a foundation for building your own practice schedule.